In Britain a vessel flying an auxiliary service ensign has a civilian crew that is not subject to the Naval Discipline Act. A naval auxiliary is not commissioned and any armament carried is for defensive purposes only and must not be used offensively. The ensign of the Royal Naval Auxiliary Service is obsolete. It was originally established in 1952 as the Royal Naval Minewatching Service. The Minewatching Service badge was the same, except that the letters in the panel below the naval crown were RNMWS instead of RNXS. 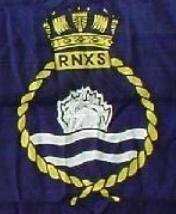 The name and badge were changed in 1962, and the R.N.X.S. was disbanded in 1994. "Blue; over wavelets barry wavy of four white and blue a mine explosion proper."